Softball season gets going tonight and I have to start the season on the disabled list. I am still recuperating from my ankle surgery and the doctor still has not given me the clearance to run yet. I see him next Monday so I am hoping he says all's well. Usually I start the year perfectly healthy but by the end of the season I have done something to myself. If it is not the ankle, it is the hamstring or the calf or the thigh or or the shoulder the elbow. Maybe starting the year on the sideline will be my only down time and everything will go smoothly. Most of the time the injuries occur because I am a stubborn man who runs around like his shortened curlies are on fire. I have started to remedy this problem by stretching before games and telling myself that I am only playing beer league softball so I can take it down a notch. We shall see how the year progresses but I am hoping for 5 months of good health and no pictures to share like the one below. I remember that photo. I think I said something about paintball last time? 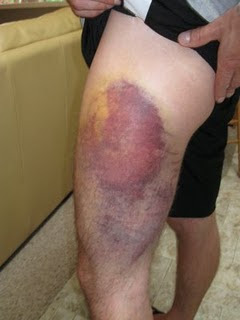 Crikey, that's some bruise. Fingers crossed for a healthy rest of year. Popped a new story online, that should get you running for cover. I saw Jesus' face in your bruise. Does that count as a miracle?? Dude, wait until you get closer to 45. It's a blast. Geez man, is that a tatooed map of Europe on your leg?